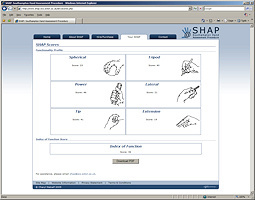 The Southampton Hand Assessment Procedure (SHAP) is a clinically validated hand function test developed by Colin Light, Paul Chappell and Peter Kyberd in 2002 at the University of Southampton. Originally developed to assess the effectiveness of upper limb prostheses, the SHAP has now been applied to assessments of musculoskeletal and unimpaired participants, with further trials expected on neurological participants in the next year. The SHAP is made up of 6 abstract objects and 14 Activities of Daily Living (ADL). Each task is timed by the participant, so there is no interference or reliability on the reaction times of the observer or clinician. The objects are placed on a two-sided board; blue felt for the abstracts, and red plastic for the ADL. All the SHAP objects (abstracts and ADL), board and timer are fit neatly into the case, which also serves to house additional ADL tasks. Each task is timed by the participant and recorded on an assessment sheet by the assessor. Using the method described by Light, Chappell & Kyberd, times can then be normalised to 100 and each of the 26 tasks is classified within one of the six prehensile patterns. This process generated the SHAP Functionality Profile. In this way, an assessor can generate a quantifiable assessment of hand function that can be broken down into the six prehensile patterns. Therefore the assessor can then visualise whether a participant has exceptional power and spherical grip, or impaired function in the ability to perform finer manipulations such as tip and tripod grips. In addition, a SHAP Index of Function score can also be generated, which is one number that provides an overall assessment of hand function. SHAP scores do not plateau at 100, instead scores greater than 100 can be achieved if a participant is exceptionally quick at a given task or series of tasks. Scores less than 100 are an indication of how impaired a participant's hand function is, and whether it is a particular type of grip posture that is causing a lower score. The SHAP software for generating scores is part of this website, and accessible by purchasing or hiring the SHAP.